Pink to Green: Fun Friday! Thank you to the Chic Coles for giving me the Honest Scrap Blog Award! Say thanks and give a link to the presenter of the award. Share "10 Honest Things" about myself. Present this award to 7 others whose blogs I find brilliant in content and/or design, or those who have encouraged me. Tell those 7 people they've been awarded HONEST SCRAP and inform them of these guidelines in receiving. 1) I am a lefty—so is my Mom, sister and husband. Look out when eating dinner with us if you are right handed! 2) Learning to ski is at the top of my list, but as we discovered last year, I’m terrified of ski lifts…. 3) I studied abroad in Florence, Italy as an undergrad and am still under the spell of La Dolce Vita. (My parents are in Italy right now and I’m so jealous!) If I could get away with riding a vespa or driving a jolly fiat in Charlotte I would, until then I watch Everyday Italian and drink prosecco as much as possible. 4) My sister is my hero. 5) Besides yoga, Zumba is becoming one of my favorite activities! 7) I fell in love with a Great Dane puppy last week and can’t stop thinking about her. 8) Every time I go shopping, I end up with a white tee-shirt. 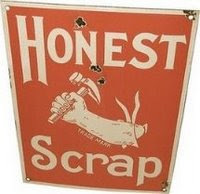 I would like to present the Honest Scrap Award to anyone who would like to play along! Thanks again, Chic Coles, have a wonderful weekend!! i had a dream last night that you were featured on the lil bee (http://www.thelilbee.com/) and i was so jealous!!! meghan, hope you'll play along with this if you are interested; i'm sure you would have such a creative list! also, i love the lil bee... have you tried the feather report app yet? I have a Great Dane and I absolutely love her. If you can deal with an extra large breed, I definitely recommend them. You should come to our ski house and go on the bunny slope, get you accustomed to ski lifts! Have a great weekend and congrats!! Congrats on the blog award!!! Megan, what a great list! I feel the same way about Italy...toured it with my sister (who's also my hero! ) since then have been begging my husband to get us stationed there!! i'm obsessed with it! Its in my blood, my maiden name is Fazzaro and my granny immigrated from Italy through ellis island to America!! Congrats on your award! Ciao! Very cute blog! I love yoga too. Just started a few months ago. That's one of the best ideas I've seen -- to share ten personal things!